Little-known fact about me: I didn't know until 9th grade that you could buy tater tots at the grocery store. I mean, I had eaten them before. I'm not a Martian. But whenever I had seen these modern-day potato wonders, it was always next to corn dogs on a school lunch tray. I assumed they were like those little chocolate milk cartons and tiny ketchup packets. When you're a little eater, you don't always know what's going on. I had no idea what a huge weirdo I apparently was until I was sleeping over at a friend's house and saw their mom pull a bag of these little buddies out of the freezer. 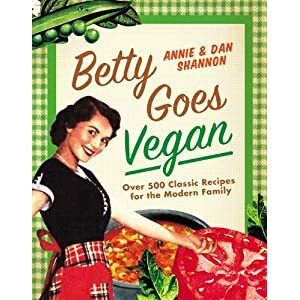 For many of us, going vegan meant caring what went into your body, caring about what our food did for the environment, and cutting back on cute vegetable-based foods with sweet little names like 'tater tots'. That's why the second I saw this recipe, I knew that folks were going to love it. It'll give you a chance to make something so incredibly American and campy-fun-awesome-sauce, without being completely and ridiculously bad for you, because we took out the cheese sauce and ground beef. This recipe is basically a Shepherd's Pie, with a light Tex-Mex Chili and a Tater-Tot top... oh, and there's a layer of Daiya Pepperjack Cheese in there too. When it gets served up, you get a whole bunch of spicy beans and vegetables with a few cheesy crispy tots. 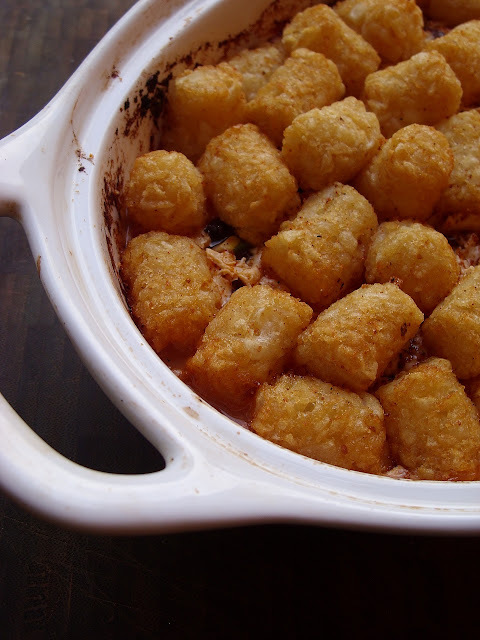 So you can enjoy your tater tots again, but in moderation. So ya know, no guilt... especially if you use these organic tots. Tip #1: NEVER read a new post BEFORE you've had breakfast! So incredibly hungry now! Anyone out there have a recommendation for a Cilantro replacement herb? Or would it taste OK to leave it out entirely? Parsley. I am in the "I Hate Cilantro" club. Braggs is Braggs Liquid Amino Acids. It's a lot like soy sauce or tamari and we often use it to replace salt in a recipe because it has a savory "beefy" flavor. I'm writing to you to ask your help and support for a good cause. We're are trying to abolish the "Bullfights" in Spain, specially one that has been celebrated a week ago in a little Town. Each year, in Tordesillas (Spain), a bull is speared to death by hundreds of people on a local festivity called 'Toro de la Vega'. Alone bull is chased and harassed through the streets and into a field, where men on foot and horseback wield lances. The terrified and confused animal is tortured and repeatedly stabbed until he lies crippled and dying. His testicles are often cut off while he is still alive. The person who ultimately kills him is awarded a ceremonial spear and a medal by the City Council. This year, the bull, "Afligido"— Spanish for "Sorrowful"—eventually died after being stabbed in the head with a screwdriver. It is the cruelest tradition incurred upon an animal in this country. For this reason, Tordesillas has become a symbol of animal cruelty repudiation. In this group (https://www.facebook.com/pages/A-que-consigo-1000000-de-personas-en-contra-del-Toro-de-la-Vega/114321025340899) we're trying to get together and do something about this cruel human act, we're almost 57,000 people against this act. The most sad thing about this, is that the "Bullfights" and the festivity "Toro de la Vega" are taking in concern to become a Cultural Patrimony of Spain. Can you believe that?. We're looking forward to get your support, we need all the support of animal lovers. Please join us in our group and sign up our Petition! We want people get to know this barbarity....TOGETHER WE CAN STOP BARBARITY! !LONG LIVE THE BULL! Thank you in advance for your help and time ! Some people can't stand cilantro. My husband is one. Parsley makes a good substitute, green, clean without the "soapy" taste some people get from cilantro. When I showed my husband this, he decided we had to have it for dinner. 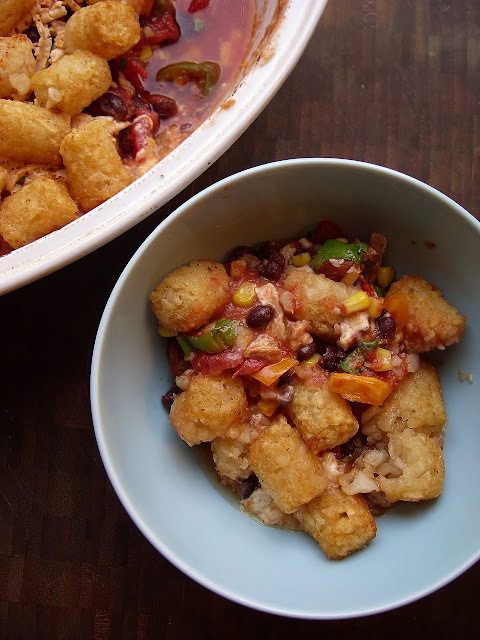 Luckily, I had some leftover veg chili in the freeze, so all I had to do was run out for tater tots...seriously, this is so incredible delicious and fun! Made this last night and it was goo-ood! Left out the jalapeno and hot sauce because I live with a bunch of light-weights (come on 4-year-old, really?) but it was great anyway. 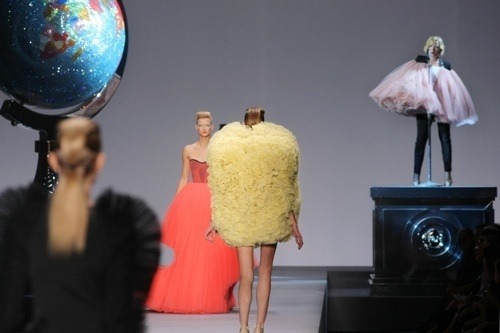 I like to try and pretend that I'm a grownup, but then I see a tater tot and I want to eat it. I don't think I'd put them in my pants pocket to eat for later, but still. Damn, I want to make this. Looks delicious! I'm going to make this for my family this week. What size tomato cans do you use ... 15 oz. or 28 oz.? Oh thanks for spotting that1 It was 2 14 oz cans. I was not sure what you meant by "Mexican-style" diced tomatoes. I assume you meant tomatoes & green chilis...a la Rotelle. So I used those. They worked PERFECTLY in this recipe EXCEPT, I'll drain them next time. It made my hotdish very soupy on the bottom, which I remedied by spooning off the juice. Very delicious recipe! Thank you!